Bassist extraordinaire Alex Pershounin is mixing Bebop, Funk, Blues, Latin, and even Bach/Jazz hybrid styles with the focus on the Bass. This musical journey through diverse colors and moods will amaze and excite you! Alex Pershounin has performed extensively throughout Europe and United States in both jazz and classical settings and has been featured as a performer and composer on such internationally recognized music events as Montreaux Jazz Festival in Switzerland, Pori Jazz Festival in Finland, Europe’s Jazz Contest in Belgium, and New Orleans Jazz Fest, among many others. His performing credits include collaboration projects and appearances with world-class artists ranging from Bob Berg, Mulgrew Miller, Conrad Herwig, and Benny Golson to Itzhac Perlman, Yo Yo Ma, and Ray Charles, to name just a few. He also has recorded several commercially released compact disc albums and music to four full-length motion pictures. He holds DMA and MFA degrees from the University of Southern Mississippi and MFA and BM degrees from Russia’s most prestigious music institution: Gnessins' State Academy of Music in Moscow. Prior to coming to Columbus State University, where he is serving as the director of jazz studies and professor of bass studio, Dr. Pershounin had taught jazz studies and bass studio at Minnesota State University Moorhead, Westfield State College, University of Southern Mississippi, and various music institutions in Russia. His students won national and international competitions, were accepted in most prestigious music institutions, and successfully developed their own professional music careers. A superb bassist who is equally skilled in jazz and classical music, Alex Pershounin is the director of jazz studies and the professor of the bass studio at Columbus State University. In his career he has been on the soundtracks of motion pictures and worked with such artists as Mulgrew Miller, Benny Golson, Yo Yo Ma and Ray Charles among others. 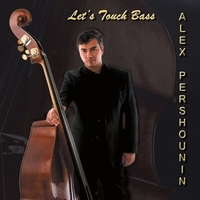 As he shows throughout Let’s Touch Bass, Alex Pershounin uses the full range of the bass, tuning in fifths rather than fourths which allows him to get the lowest possible notes along with the highest. He is a brilliant player both technically and in his creativity. Let’s Touch Bass showcases the virtuoso in several creative settings. The first four selections are all Pershounin originals and feature his bass in a jazz combo with Tyrone Jackson, Geoff Haydon or Jose Garcia on piano and drummer Marlon Patton. “Let’s Touch Bass,” which has Sam Skelton’s alto playing the lead during the melody statement along with a soulful and inventive solo, has a catchy melody line. The blues-with-a-bridge piece also has fine spots for Jackson’s electric keyboard and the leader’s bass. “Tales Of The East,” a song with hints of the Mideast, is most notable for Skelton’s passionate soprano and the hypnotic bass pattern. “Waltz For Natalia” has flugelhornist Gordon Verrick in Skelton’s place. The interplay between Pershounin and Verrick including a closing tradeoff is impressive. “Samba For Daniel” is an attractive and infectious piece that is quite fun. Skelton’s flute playing adds heat to the music. Charlie Parker’s tongue-twisting “Donna Lee” is performed by Alex Pershounin, guitarist Trey Wright and drummer Marlon Patton. Pershounin’s bowed bass and Wright’s swinging guitar blend together and contrast each other quite well. The trio of Pershounin, Patton and pianist Geoff Haydon turns a pair of Bach melodies (“The Bouree from Cello Suite No. 3” and “The Courant from Cello Suite No. 3”) into swinging and inventive jazz. The close and often-spontaneous communication between piano and bass (whether bowed or plucked) is outstanding throughout. With Jose Garcia taking over on piano, Chick Corea’s “Armando’s Rhumba” is quite complementary to the Bach pieces, with each of the musicians getting some solo space between the tight melody statements. Concluding this very enjoyable set is a version of “Georgia On My Mind” that features Alex Pershounin overdubbing his bowed bass over his walking bass. As with everything else on Let’s Touch Bass, the music is memorable, flawless played, and full of subtle surprises. Let’s Touch Bass is an outstanding effort and highly recommended!